Lors d'une interview donnée aujourd'hui à Shanghai Disneyland, Bob Iger a confirmé l'ouverture de nouvelles attractions cette année encore (en partenariat avec Chevrolet) ainsi que l'ouverture de Toy Story Land début 2017 - avant d'entamer la seconde phase de développement sur 3,9 km² situé entre Shanghai Disneyland et Shanghai Village (outlet center). La deuxième journée des célébrations d'ouverture s'est achevée avec un concert de gala devant l'Enchanted Storybook Castle de Shanghai Disneyland et feu d'artifice retransmis sur Dragon Television (appartenant à Shanghai Media Group, partenaire de Disney en Chine depuis 2014). La performance a malheureusement été raccourcie par la faute de la pluie. Les festivités se poursuivront ce jeudi avec une troisième et dernière journée au cours de laquelle le public sera invité à se joindre à partir de midi. Pas moins de 800 journalistes ont été accrédités pour couvrir l'événement ! 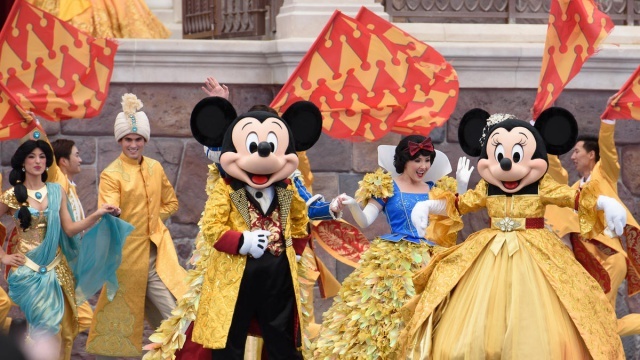 On the eve of the Grand Opening of Shanghai Disney Resort, Disney celebrated the historic occasion with a star-studded, two-hour broadcast that captured the extraordinary spirit of the first Disney resort in Mainland China. Marking a moment years in the making, world-renowned composer Tan Dun conducted the Shanghai Symphony Orchestra in an inspiring performance of his original composition, “Igniting the Magical Dream” —which celebrates the occasion’s poetic message—and Disney stories came to life in wondrous ways on the Enchanted Storybook Castle. Disney Chairman and chief executive officer Bob Iger said the musical celebration was a perfect way to share the grand opening excitement with China. The two-hour special was broadcast nationwide on China’s Dragon TV. The “Shanghai Disney Resort Grand Opening Celebration” took a special look at Shanghai Disneyland in the two-hour program. The show is being presented for U.S. audiences on Disney Channel, Disney Junior and Disney XD and each channel’s App, and on Freeform. During the special, beloved composer Tan Dun, widely known for film scores including “Crouching Tiger, Hidden Dragon,” led musicians in a stirring performance of the symphony, which blended Chinese and Western musical motifs along with iconic Disney music. This was the first time that Disney has commissioned an original symphony to commemorate the opening of a resort. The concert also featured top celebrity performers, including famed actress Sun Li; accomplished pianist Lang Lang playing a custom arrangement of “Let it Go” from Disney’s “Frozen,” and star vocalists Tan Weiwei, Jane Zhang and Hacken Lee. Honoring the resort’s appeal to multiple generations and the dreams of young and old alike, the concert featured the talents of an elderly male Erhu player and a young female violinist playing side by side. The performance culminated with an 800-person, multigenerational choir filling the stage as Enchanted Storybook Castle sparkled with light, representing new dreams being ignited to unlock the childlike spirit in everyone. In the park, these same celebrated talents performed live at the Evergreen Playhouse for guests of the three-day Grand Opening celebration. Afterward, the celebration continued in Tomorrowland, where guests enjoyed a performance by contemporary pop star Momo Wu at the Pepsi E-Stage. Thursday, June 16, 2016, will mark another historic milestone as Shanghai Disneyland opens its gates and welcomes its first official guests. Shanghai Disney Resort is the first Disney resort in Mainland China, offering Disney storytelling and experiences designed especially for Chinese guests of all ages. The resort’s theme park, Shanghai Disneyland, features world-class attractions and live entertainment spectaculars across its magical themed lands. Adventure Isle immerses guests in a newly discovered lost world. The Gardens of Imagination celebrates the wonders of nature and joy of imagination with whimsical décor and interactive spaces. Mickey Avenue is the first main entry at a Disney theme park that’s inspired by the colorful personalities of Mickey Mouse and his pals. Tomorrowland is a place of limitless possibilities, where the promise of tomorrow looks brighter than ever. Treasure Cove is the first pirate-themed land in a Disney park, an exciting place to join the adventures of Captain Jack Sparrow and Davy Jones. The largest of all the lands, Fantasyland, is inspired by Disney’s animated films and is home to the majestic Enchanted Storybook Castle—which represents all of the Disney Princesses. Adjacent to the theme park is Disneytown, a vibrant shopping, dining and entertainment district that includes the Walt Disney Grand Theatre, home to the first-ever Mandarin production of the Broadway hit Disney’s THE LION KING. Another guest highlight is the World of Disney Store, the first in Asia, offering a comprehensive collection of Disney merchandise and many products designed especially for Shanghai Disney Resort. Guests may continue their Disney experience at the resort’s two hotels, Shanghai Disneyland Hotel and Toy Story Hotel. Both imaginatively themed hotels are located near the theme park and promise a fun, relaxing stay. Near the hotels and Disneytown, Wishing Star Park offers guests the opportunity to enjoy peaceful greenery, a walking path and a glittering lake, with approximately 500,000 square meters open to the public, free of charge. Shanghai Disney Resort offers a distinctive Disney experience that reflects the beauty and unique identity of today’s China—from entertainment with Chinese acrobats and traditional regional dining options, to the Shikumen architecture at Disneytown and Chinese Zodiac designs in Garden of the Twelve Friends. Throughout the resort, guests will encounter another distinguishing Disney difference: warm hospitality and renowned guest service delivered by Disney cast members. Shanghai Disney Resort - 16 juin 2016. L'article publié précédemment par Shanghai Daily a été édité et complété par ses auteurs, voici ci-dessous la dernière édition. Une attraction (inédite) ouvrirait donc encore cette année et une autre inspirée de l'univers Toy Story au début de l'année prochaine. La phase deux du développement du resort s'inscrit dans le long-terme. La capacité du parc est de 40.000 visiteurs. THE Walt Disney Co will expand the Shanghai Disney Resort, which opens today, “sooner rather than later” and some construction work has already begun, Disney chairman and CEO Robert Iger announced in Shanghai yesterday. “When we open, we will continue the construction to expand what is on the opening-day menu and we are already discussing what to do next year,” he told media assembled at the jungle-themed Adventure Isle attraction at Shanghai Disneyland. There is a 7-square-kilometer parcel on which the company can add more attractions, Iger noted. The US$5.5 billion Disney resort, which took about five years to build, is a joint venture between Disney and the Shanghai Shendi Group. In another interview, Iger said more attractions are already in the pipeline, including one supported by the automobile brand Chevrolet, which will open later this year, and one opening early next year based on the Disney cartoon franchise Toy Story. On the longer term, the second phase of the theme park, which will cover 3.9 square kilometers, will be situated between the current park and the Value Retail Shanghai Village, an outlet adjacent to Disneyland. The company has altered its plans since breaking ground in April 2011, increasing capacity and adding attractions that give the park a uniquely Chinese flavor. Iger said the attractions Soaring over the Horizon, Frozen: A Sing-Along Celebration, and the Wandering Moon Teahouse were added with Chinese tastes in mind. Zootopia cartoon characters will also be joining the iconic parade at the theme park because they are particularly popular in China, Iger added. “After we broke ground, we saw that there was a growing number of Chinese tourists visiting Shanghai and a general growth of the Chinese market, so we decided that we should build something bigger than we had planned,” he said yesterday. The capacity of the theme park has been increased to 40,000 people from the planned 30,000. Iger yesterday said the Shanghai Disney project needs to show “great respect” for the Chinese people and culture, calling Disney an “invited guest” of the Chinese government. Shanghai Daily - 16 juin 2016. Photo : Ng Han Guan / Associated Press. How Chinese is Shanghai Disney ? With its giant Starbucks, Cheesecake Factory and Wolfgang Puck restaurant, you might for a minute mistake the new Shanghai Disney Resort for Anaheim or Orlando, Fla. But little differences gradually come to light: Squat toilets? Check. “The Lion King” in Mandarin (with no English subtitles)? Check. Eel over rice and Peking duck pizza for lunch? Check and check. So just how Chinese is Shanghai Disney? That’s been the $5.5-billion question for Disney fans around the globe as the Burbank-based entertainment giant opens its first park in mainland China in close cooperation with state-run Chinese investment companies and Communist Party officials. Unlike its other international parks in Tokyo, Hong Kong or Paris, Disney executives from Chief Executive Bob Iger on down have been talking about a park in Shanghai that’s far more sensitive to the culture of its host – repeatedly touting the phrase “authentically Disney, distinctly Chinese.” But what that would mean in practice wasn’t entirely clear. Mainland China has long been seen as a different market – less Westernized, and perhaps more sensitive to matters of cultural imperialism. Even in recent years, Communist Party authorities have stressed the need to protect “traditional Chinese culture” amid the rising popularity of Western movies, TV shows, music and clothing. As the world’s most populous nation, with a burgeoning middle class whose numbers may soon rival that of the entire U.S. population, it’s no wonder that Disney has been handling the issue with the utmost delicacy since reaching a deal for the park in 2009. Addressing the media Wednesday morning at Shanghai Disney, Iger called his company “invited guests” in China. Certain features were ruled out early on as “not relevant” (read: too American) for the Shanghai park, including “Main Street, U.S.A.” (modeled on Walt Disney’s own hometown of Marceline, Mo.). And who needs a monorail, when Shanghai itself has a real maglev train, as well as regular bullet train service? Main Street has been replaced by Mickey Avenue, which looks and feels a lot like Main Street, with facades including a city hall, a First Bank of Scrooge (McDuck), a post office, and a Practical Pig hardware. Nearby, on a passage called Flower Street, there’s an old-timey garage covered in hubcaps and license plates from states including California and Nevada – with a few from China thrown in as well. There are further nods to Chinese culture. In front of the Enchanted Storybook Castle, for example, is a walkway that Disney calls the Garden of the 12 Friends, with a dozen mosaics featuring characters like Hamm the pig from “Toy Story” and Tigger from “Winnie the Pooh” representing the 12 Chinese zodiac animals. Even so, Shanghai Disneyland passed on the attraction “Toy Soldiers Parachute Drop” based on the little green plastic U.S. Army soldiers in “Toy Story,” though it’s at the Paris and Hong Kong parks. An attraction that vaguely brings to mind the American military would probably fare poorly in China. A Chinese flair has been incorporated here and there, most easily in “soft” attractions like a Tarzan-themed stage show that features Chinese acrobatic moves. Hardscape features like the Storybook Castle, though, are largely Western style. The name of each attraction is translated into Chinese, and narration is in Mandarin. Props like the “wanted” posters decorating the queue for the “Pirates” ride are presented in both Chinese and English. And the food is strongly Chinese; resort managers say 70% of the fare on offer is Chinese, with another 20% categorized as Asian. That means it’s easier to find Kung Pao chicken for lunch than, say, a hot dog. The food has earned mixed reviews both on price and quality. A number of Chinese guests who visited the park Wednesday, on the final preview day before it officially opens, said they didn’t expect – or want – too many Chinese elements. Julie Makinen pour Los Angeles Times - 15 juin 2016. Bob Iger cite Zootopia comme possible thème d'une future attraction. Sept millions de visiteurs attendus cette année. China represents “incredible potential” for Walt Disney, said company chairman Bob Iger ahead of the opening of its Shanghai theme park today. The US$5.5 billion complex is the first step onto mainland soil by the Western media giant as it seeks to grow its brand beyond already saturated markets back home. And the company was already eyeing expansion, Iger said. “China represents incredible potential for Walt Disney in the near and long term,” he told the media on Wednesday. The company had built “China’s Disneyland” instead of “a Disneyland in China”, he said. Among the localised attractions is a Putonghua version of The Lion King broadway musical. The resort, which includes Shanghai Disneyland and two themed hotels, covers 4 square kilometres, but an additional 3 sq km was available for expansion, Iger said. New attractions would feature some of Disney’s latest hits, such as Zootopia, he said. “We are clearly benefiting from the growth of the Chinese movie market, with stunning success with some of the most recent films,” he said. Five of the company’s films, including Alice Through the Looking Glass and Star Wars: The Force Awakens, have raked in about 5 billion yuan (HK$5.88 billion) at the mainland box office. About one million people have visited the park since it began trial operations in April. About 7 million were expected this year, according to an earlier projection by USB investment bank. Those numbers are roughly on par with the attendance at Hong Kong Disneyland, which saw 6.8 million visitors in 2015. 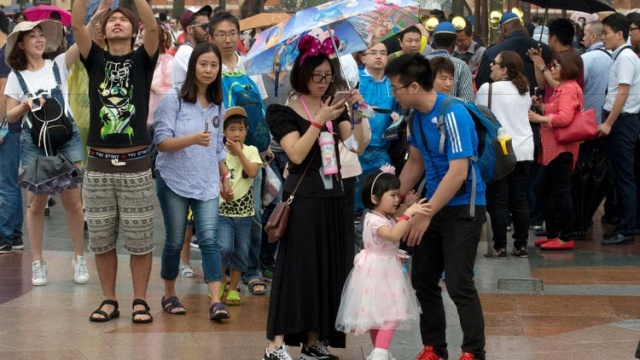 Andrew Bolstein, vice-president for operations of Shanghai Disneyland, said police officers and urban management officials would work with the company’s security guards to manage crowds. While the park has roused the curiosity of mainlanders, Hongkongers appear mostly indifferent so far. Hong Thai Travel in Hong Kong recently included Shanghai Disneyland on the itineraries of its nine tours to the Yangtze River Delta area, but interest had been tepid, it said. “The bookings are just so-so,” said spokeswoman Cherie Fong. The agency had reserved a large number of admission tickets but many remained unsold. But Arthur Xue, president of China Travel Service Head Office, said the opening had boosted sales of its Shanghai travel packages on the mainland. SCMP - 16 juin 2016. Ca serait génial une attraction sur Zootopie ! Je viens de regarder la cérémonie d'ouverture (gala-concert) en entier, et c'est vraiment magnifique ce mélange Disney & Chine je trouve. Connaissez vous la chanson quand les enfants habillés en doré chantent ? C'est du Disney ou une chanson nationale ? Ca ne reste "qu'un" parc d'attractions, ni l'euro 2016, les J.O ou quoi, mais la cérémonie était mieux que certains évènements (genre notre cérémonie pourrie de l'euro). With the Grand Opening of Shanghai Disney Resort just one week away, cast members and Imagineers are putting the finishing touches on our newest family entertainment destination – an international Disney experience that grew out of years of collaboration between Walt Disney Imagineering (both in Shanghai and in the U.S.), Shanghai Shendi Group, and a team of renowned Chinese designers, engineers, artists and cultural advisors. This unique blend of Disney magic and China’s cultural spirit is what Disney chairman Bob Iger refers to as “authentically Disney and distinctly Chinese,” and it has been the guiding principle of Shanghai Disney Resort. The design of Shanghai Disney Resort carefully reflects the desire for peaceful surroundings and family bonding time that are so important in Chinese culture. In Shanghai Disneyland, Gardens of Imagination is the first land at a Disney park designed as a garden, with 15 acres of lush, green space for families to gather and relax. Wishing Star Park, just outside the main entrance to Shanghai Disneyland, evokes the native landscape and historic legacy of China’s Yangtze River Delta. The park offers guests a chance to escape the busy pace of modern life to enjoy vibrant and thriving natural habitats, including woodlands and gardens with both Chinese and Western roses. Classic Disney storytelling comes to life in new ways at Shanghai Disney Resort, as many familiar songs and stories are presented in Mandarin. On Seven Dwarfs Mine Train, the song “Heigh-Ho” was recorded in Mandarin especially for the attraction. At the Walt Disney Grand Theatre in Disneytown, guests can enjoy the first-ever Mandarin production of the Broadway hit THE LION KING. 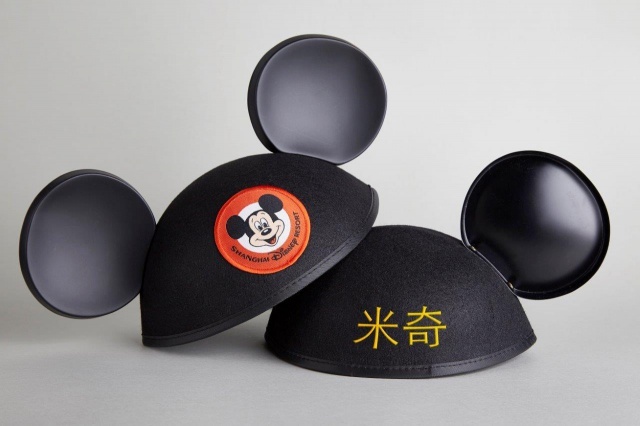 And in a first for any Disney park, guests may have their names embroidered on Mickey Mouse ear hats in either Chinese or English! Design and art play a major role in creating the distinctly Chinese experience throughout Shanghai Disney Resort. Chinese artists sculpted and painted 62 magnificent, flying horses on the Fantasia Carousel. In Disneytown, traditional Shikumen architecture reproduces the unique heritage of Shanghai, and Liuli glass – a traditional Chinese art form – is represented in seven large Mickey Mouse sculptures crafted by a local Chinese artist. 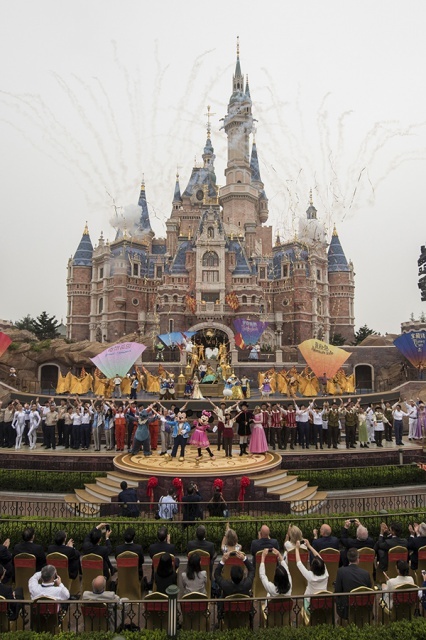 Disney’s world-class entertainment team has worked closely with renowned Chinese directors, choreographers and designers to bring classic stories to life at Shanghai Disneyland. Chinese acrobats perform in “Tarzan: Call of the Jungle,” adapted by choreographer Li Xining, with intricate costumes created by designer Li Rayding. The magical musical, “Golden Fairytale Fanfare,” presents spectacular moments from Disney stories, directed by Chinese stage director and filmmaker Chen Shi Zheng with an original song written in Mandarin by Keith Chan and Peter Kam. We are excited to welcome families to this unique Disney experience when Shanghai Disney Resort officially opens June 16! Keep an eye on the Disney Parks Blog for more as the big day draws closer. Erin Glover pour Disney Parks blog - 15 juin 2016. De gauche à droite : CPC Politburo member Han Zheng (Party Secretary of Shanghai), CPC Politburo member Wang Yang (State Council Vice Premier) et Bob Iger (chairman & CEO of The Walt Disney Company). Shanghai Disney Resort, the first Disney resort in Mainland China and the sixth worldwide, celebrated its historic Grand Opening today, culminating one of Disney's most ambitious projects ever. The wonder and imagination of Disney greeted the people of China in magical new ways as the gates opened to Shanghai Disneyland, a theme park like no other with the biggest, tallest castle in any Disney park, the first pirate-themed land and Disney's most technologically advanced park to date. Bob Iger, chairman and chief executive officer, The Walt Disney Company, celebrated the opening of the one-of-a-kind vacation destination with thousands of distinguished guests, celebrities and Chinese officials. Shanghai Disney Resort reflects Disney's 60-year history of innovation, creativity and storytelling, in a way that is authentically Disney and distinctly Chinese. "The grand opening of Shanghai Disney Resort is a celebration of creativity and collaboration, a triumph of imagination and innovation, and a testament to the strong partnership between Disney and China," Iger said. "Together we have created an extraordinary destination, a magical place unique in all the world, where East meets West, the past meets the future, and anything is possible for those who believe. It is our sincere hope that this spectacular place will inspire wonder and create joy for the people of China for generations to come." Tens of thousands of guests entered Shanghai Disneyland on its Grand Opening day to explore world-class attractions and live entertainment spectaculars­—many being offered for the first time in a Disney theme park. Thousands more guests visited the resort's Wishing Star Park recreational area and Disneytown, a vibrant retail, dining and shopping district that is home to the Walt Disney Grand Theatre, where guests may experience the first Mandarin production of Disney's musical hit THE LION KING. Those areas, along with two imaginatively themed Disney hotels, offer guests a complete vacation destination with something for everyone—young and old, girls and boys, families and multi-generational guests. 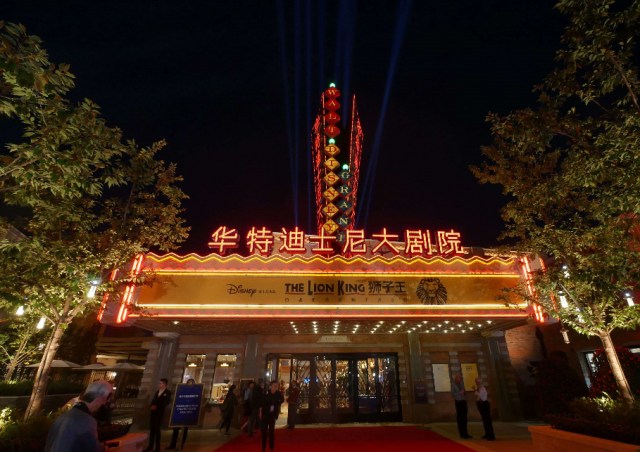 The three-day Grand Opening event also included two red-carpet occasions: Tuesday's premiere of the first Mandarin production of THE LION KING, now showing at the Walt Disney Grand Theatre, and Wednesday's gala concert with celebrity performers at Evergreen Playhouse in Shanghai Disneyland. The six themed lands of Shanghai Disneyland invite guests to step into new worlds of imagination and fantasy. Adventure Isle immerses guests in a newly discovered lost world. The Gardens of Imagination celebrates the wonders of nature and joy of imagination with whimsical décor and interactive spaces. Mickey Avenue is the first main entry at a Disney theme park that's inspired by the colorful personalities of Mickey Mouse and his pals. Tomorrowland is a place of limitless possibilities, where the promise of tomorrow looks brighter than ever. Treasure Cove is the first pirate-themed land in a Disney park, a place to join the adventures of Captain Jack Sparrow and Davy Jones. The largest of all the lands, Fantasyland, is inspired by Disney's animated films and home to the majestic Enchanted Storybook Castle—the tallest, largest and most interactive Disney castle in the world. Adjacent to the theme park is Disneytown, which features approximately 50 international shopping and dining locations in five unique areas. The World of Disney Store, the first in Asia, offers a comprehensive collection of Disney merchandise, with products designed especially for Shanghai Disney Resort and the Grand Opening. The lavish Walt Disney Grand Theatre, also in Disneytown, is now playing the Mandarin premiere of Disney's hit musical, THE LION KING, a separately ticketed event. Guests may continue their Disney experience at the resort's two hotels, the elegant Shanghai Disneyland Hotel and the whimsical Toy Story Hotel. The themed hotels are conveniently located near Shanghai Disneyland and promise a fun, relaxing stay. Near the hotels and Disneytown is Wishing Star Park, which offers guests the opportunity to enjoy peaceful greenery, a 2.5 kilometer walking path and a glittering lake, with approximately 500,000 square meters open to the public. Incorporating unique characteristics that Chinese guests will recognize and appreciate, Shanghai Disney Resort offers a distinctive Disney experience that reflects the beauty and unique identity of today's China—from traditional regional dining cuisine and Chinese acrobatic performances, to the Shikumen architecture at Disneytown and Chinese Zodiac designs in Garden of the Twelve Friends. The Walt Disney Company / Walt Disney Parks and Resorts - 16 juin 2016. 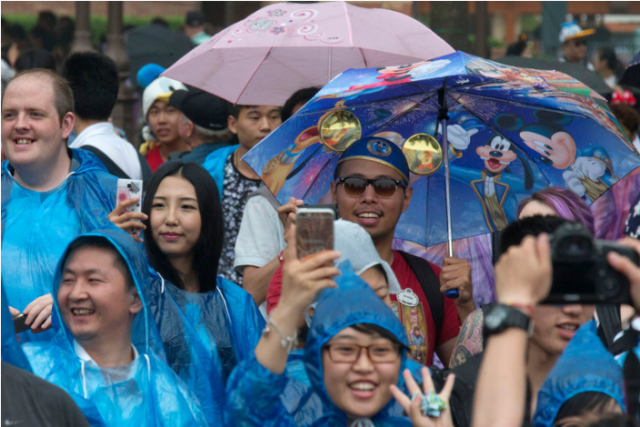 Under dark skies and intermittent showers, Walt Disney Co. officially threw wide the gates of its most expensive international resort to mostly orderly crowds on Thursday, creating a beachhead for the popular entertainment company in the most populous nation. Iger also read a letter from President Obama, who said the park “captures the promise” of the bilateral relationship between the U.S. and China. After a brief burst of fireworks above the Enchanted Storybook Castle, the first wave of park visitors hurried through the gates around 11:30 a.m., toting umbrellas or wearing rain slickers. As they rushed through the slippery streets of Shanghai Disneyland, clutching maps and cameras, rows of Disney staff smiled and waved. The resort is a joint venture, with Disney holding a 43% stake and the state-owned Shanghai Shendi Group owning the rest. Disney’s goal is not only to draw revenue from theme park visitors but to boost the exposure of China’s 1.4 billion residents to Disney merchandise, television shows and movies. 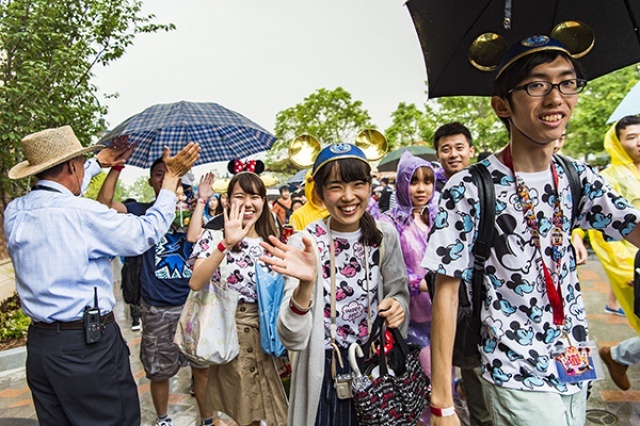 Still, many visitors at the opening day of Shanghai Disney were already Disney superfans. Claudia Wu, 30, an employee at an American law firm in Shanghai, came to the opening with three other fans that she met via Weibo, China's version of Twitter. All four were decked out in Disney outfits and squeezing Disney stuffed animals. "When we watch Disney movies it makes us really happy," Wu said. Already, Iger has suggested that the park could expand “sooner rather than later,” noting that there is more than 2.5 square miles of land adjacent to the resort that could be built upon. As it is, the resort has access to more than 330 million people within a three-hour car ride or train trip. Disney’s main target is the country’s upper middle class, which is forecast to double to 100 million by 2020, according to the Boston Consulting Group. In the first year, Disney’s partners, Shanghai Shendi, have projected 10 million to 12 million people will visit Shanghai Disneyland’s six themed lands encircling the Enchanted Storybook Castle. The resort also includes two hotels, a shopping district and 99 acres of gardens, lakes and parkland. Shanghai’s opening day events were somewhat tarnished by news from Florida. Authorities there say the shooter in the mass killing at an Orlando nightclub was first spotted at the Walt Disney Resort, and investigators were trying to determine if he was planning an attack at the Florida theme park. Also, a toddler who was playing near a lake at a Disney resort hotel near the Orlando theme park was dragged away and killed by an alligator. “Everyone at Disney joins me in offering our deepest sympathies,” Iger said in a statement about the toddler’s death. Back in Shanghai, Disney has taken great pains to ensure its brand of entertainment translates well for the Chinese people. Disney hired Chinese architects and designers to create a resort that tries to keep the iconic Disney character but downplays some of the most direct Americanness and pays homage to the Chinese culture. For example, the Main Street U.S.A. that is found at other Disney parks has been nixed. The park’s entry still has an American vibe with facades including a city hall, a post office, and a hardware store, but it’s called Mickey Avenue. Near the castle, a pathway that Disney calls the Garden of the 12 Friends features a dozen mosaics of characters such as Hamm the pig from “Toy Story” and Tigger from “Winnie the Pooh” representing the 12 Chinese zodiac animals. A restaurant called Wandering Moon Teahouse injects some Chinese architectural flavor between Mickey Avenue and the castle. Designers have added more seating at restaurants after finding that Chinese guests linger longer over meals, and incorporated more live entertainment to appeal to those Chinese patrons who prefer shows and spectacles to thrill rides. Grassy picnic grounds have been built into the park for guests who want to bring their own meals into the resort. But the resort still has the earmarks of its American cousins, including a Starbucks coffee outlet as well as a Cheesecake Factory and a Wolfgang Puck restaurant. Inside the park, guests queued up for more than half an hour to await the opening of a turkey leg kiosk; some said they were eager to try the dish for the first time as turkey is not generally consumed in China. Shortly after the official opening, waits for some rides were already hitting the two-hour mark, though most attractions – including the stunningly high-tech Pirates of the Caribbean Battle for the Sunken Treasure – could be boarded with waits of less than 20 minutes. At Pirates, guests received certificates designating them as some of the first riders of the attraction. Disney would not say how many guests it let into the park on Thursday afternoon, but the company appeared to be holding attendance below maximum capacity. For the first three days of operation, only those who had purchased tickets in advance could enter the park; no tickets were being sold on site. A mobile phone app delivers updates on wait times and can warn prospective guests to stay away if the park is at capacity. But with rain falling with increasing intensity as the afternoon wore on, there seemed to be more traffic heading away from the park than to it; Baidu’s online map service sent out an alert saying roads leaving the resort area were clogged around 5 p.m.
Jeffrey Towson, a professor of investment at Peking University and author of the “1 Hour China Consumer Book,” said Disney couldn’t have timed its entry into the market better because China’s booming middle class is hungry for entertainment, particularly family entertainment. At the same time, local competitors are still fairly weak and the government is welcoming of Disney’s investment. Julie Makinen pour Los Angeles Tlmes - 16 juin 2016. “Mickey Maose” has officially arrived. In a rain-dampened ceremony attended by Chinese dignitaries, the Walt Disney Company on Thursday opened its $5.5 billion Shanghai Disney Resort, a theme park and hotel complex that represents a hard-fought victory in China for the singularly American entertainment conglomerate. “Our dream comes true,” a beaming Robert A. Iger, Disney’s chief executive, said in Mandarin at the ceremony’s start. On a lighter note, Wang Yang, one of China’s vice premiers, stood onstage in front of the park’s lavish storybook castle and joked that the rain was a sign of good luck — the “rain of U.S. dollars and RMB,” he said, referring to China’s currency, the renminbi. Disney owns 43 percent of the resort, with the majority stake held by a Chinese state-controlled consortium. With that, fireworks exploded, fountains danced and jubilant performers dressed as Disney princesses took to the stage as more than 30 dancers and flag twirlers frolicked. Mr. Iger and his public affairs teams, working nearly around the clock from Shanghai in recent days, also had to contend with the mass shooting on Sunday in Orlando, Fla., which is in many ways a Disney company town. Disney employees were among the shooting victims; it was subsequently reported that the gunman, Omar Mateen, had scoped out a Disney World shopping complex. In Shanghai, more than a year of meticulous planning resulted in an opening that was surprisingly smooth. So far, the park here has suffered none of the cultural missteps that marred Disney openings in France and Hong Kong over the decades. “I brought my daughter here because she loves Mickey,” said Zhang Yan, 28, who came on opening day with her daughter Li Xinyi, 7, who was wearing pink princess regalia. Ms. Zhang said she had driven three hours from Yangzhou. Mr. Iger’s goal for Shanghai Disneyland was nothing short of immediate perfection, but no amount of experience, planning and focus-group research could prepare Disney for what would happen when Chinese patrons began to pour through the gates. Would they buy mouse ear headbands? How long would they stay? Would they understand that waiting in line was part of the experience? “On a lot of things, we had no idea,” Mr. Iger said, striding through the park on Saturday, an extremely sticky day on which roughly 35,000 people turned out as part of a soft opening. Mouse ears are one of the biggest sellers in stores. “I’ve even seen men wearing them,” Mr. Iger said. The monumental task of opening the park, which included planting 2.4 million shrubs, stocking 7,000 pieces of merchandise and training 10,000 employees, has had its challenges. In recent days, engineers were racing to finish an elaborate white-water raft ride, and Soaring Over the Horizon, a flight simulator that whisks riders to world monuments like the Eiffel Tower, was having some technical difficulties resulting in four-hour lines at one point. On the other hand, the Explorer Canoes, called Davy Crockett’s Explorer Canoes in the United States, have been lost in translation for some. Disney will also receive a fee for its role in managing the resort and royalties for the use of its characters. Moreover, Disney expects Shanghai Disneyland to increase interest across China for its movies, toys, clothes, video games and books. Even a little growth in China would have a big financial impact on Disney. The entertainment conglomerate generated $52.5 billion in revenue in its last fiscal year, and Asia represented about 7.5 percent of that total. Disney does not release more detailed information, but Anthony DiClemente, an analyst at Nomura Securities, estimates that Disney had $1 billion in revenue in China in 2015; excluding Hong Kong, the total is closer to $700 million — a drop in the Disney bucket. With so much at stake, Mr. Iger deeply involved himself in the preparations. He tasted the food in advance, including Mickey Mouse-shaped Peking duck pizza and what he called “distinctly Chinese” turkey legs with hoisin sauce. He gave feedback on ride-operator costumes and personally chose the spot where a statue of Walt Disney would be placed. “I said, ‘No, no, no – I want it closer to the castle,’ ” he recalled. On his tour, Mr. Iger walked through a 15-acre garden in the center of the park designed for older visitors. 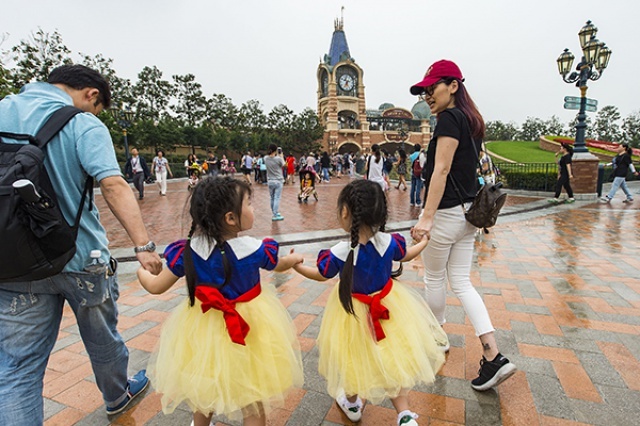 In part because of China’s longtime one-child policy, Shanghai Disneyland must have strong intergenerational appeal. As “Let’s Go Fly a Kite” from “Mary Poppins” played on the Fantasia Carousel sound system, Mr. Iger pointed toward a grove of cherry trees where 12 mosaics depicted Disney characters in Chinese zodiac style. Next, it was on to the castle, the largest, and the tallest (197 feet), that Disney has ever built. Upstairs is an ornate princess-themed restaurant with leaded-glass windows, intricately painted ceilings and chandeliers that look as if they belong at Versailles. Mr. Iger cited the opulence as an example of what he calls “the Disney difference,” which means a presentation so time-consuming and expensive that most rivals can’t come close to mimicking it. Suddenly, however, Mr. Iger’s ebullience faded. Upon exiting the castle, he had spotted a dozen people crouched in the building’s vestibule. Brooks Barnes pour The New York Times - 16 juin 2016. Walt Disney Co.’s $5.5 billion Shanghai theme park, its first in mainland China, opened with fireworks, a dancing Mickey Mouse, dignitaries and messages of support from two of the most powerful presidents in the world. “I hope that Shanghai Disney can provide visitors with safe and premium experiences and become a world class theme park. I hope it promotes exchanges across cultures of the world,” according to a letter from Chinese President Xi Jinping, read by Vice Premier Wang Yang at the park’s opening ceremony Thursday morning. Tens of thousands streamed into Shanghai Disneyland on its debut, an event that was nearly two decades in the making. The resort is the largest foreign investment ever for the Burbank, California-based company, as it intensifies the race to dominate China’s $610 billion tourism industry. “The resort captures the promise of our bilateral relationship,” U.S. President Barack Obama said in a letter, which Disney Chief Executive Officer Robert Iger read at the ceremony attended by senior officials including Shanghai’s Communist Party secretary and its mayor. The entertainment giant has already begun construction to expand attractions within the park’s 7 square kilometers (700 hectares) of land, Iger said at a briefing Wednesday. The existing resort covers about 3.9 square kilometers. While most of the 300 theme parks in China are currently unprofitable ventures, Disney is leading an incoming wave of top-notch megaparks developed by both local and foreign operators competing for a tourism industry that is set to double by 2020. About 60 more parks will open by then to serve Chinese consumers, including Dalian Wanda Group Co.’s chain of 15 “Wanda Cities.” DreamWorks Animation SKG Inc’s $2.4 billion DreamCenter is scheduled for 2017, while Haichang Ocean Park Holdings plans a marine park an hour from Disneyland and Six Flags Entertainment Corp.’s Shanghai park will be its first outside North America. “The Shanghai resort shows the confidence of the international business community in China’s economic potential,” said Wang, one of the four vice premiers in the country’s State Council, in a speech as a drizzle fell during the ceremony. Rain marks “a good and auspicious start” according to Chinese culture, Wang said. Amid the activities surrounding the Shanghai park debut, Iger offered his sympathies to the family of a child who died in an incident at Disney’s Grand Floridian Resort & Spa. The company said Thursday beaches in the Florida resort area remain closed until further notice after the death of the 2-year-old boy who was dragged by an alligator into a man-made lake. Iger, who is also the company’s chairman, first stepped foot on land that would become the Disney site in Shanghai’s Pudong district 17 years ago. The construction of the resort, a joint venture between Disney and the state-owned Shanghai Shendi Group, broke ground in 2011. “It’s a big bet on a big market and it represents not only our biggest entrance into this market but the potential to deliver great growth for the company long term,” Iger said in a Bloomberg TV interview June 9. Disney fell 0.1 percent to $98.27 by the close of trading in New York on Wednesday. The shares have fallen 6.5 percent this year, compared with the 1.3 percent gain in Standard and Poor’s 500 Index. There’s big money at stake. About 25 percent of Chinese consumers surveyed in 2015 plan to spend more of their income on leisure and entertainment, according to a March report from McKinsey & Co. They’re also showing an increasing willingness to pay a premium for better goods, with half of those surveyed seeking the “best and most expensive” products. From the peony flower design on the turret of the park’s centerpiece castle, to a comedic Beijing opera interlude in the Mandarin version of the Lion King musical, Disney has taken pains to incorporate Chinese elements at the 963-acre resort. “We didn’t build Disneyland in China, we built China’s Disneyland,” said Iger. Leia Mi, the concept designer for the Shanghai park’s castle, said that Disney conducted thorough market research into Chinese preferences. For example, while other Disneylands showcase a castle that guests walk through, the Shanghai park castle was designed with eating and retail space within them to meet Chinese expectations. 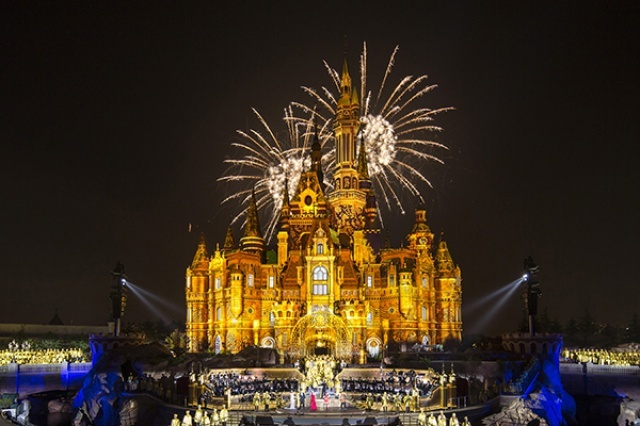 While the castles in Hong Kong and Anaheim are a tribute to the Disney character, Sleeping Beauty, the designers also chose to represent all the Disney princesses inside Shanghai’s castle. For most Chinese, there isn’t one Disney princess that stands out, Mi said. “The Chinese can learn the princesses over time and this gives them an opportunity to have an introduction to all of the princess stories,” said executive producer Ali Rubinstein. Disney’s designers and engineers said that the park was the grandest and most ambitious they have created, aided by new 3-D design technology that allowed them to identify and solve problems before construction began. 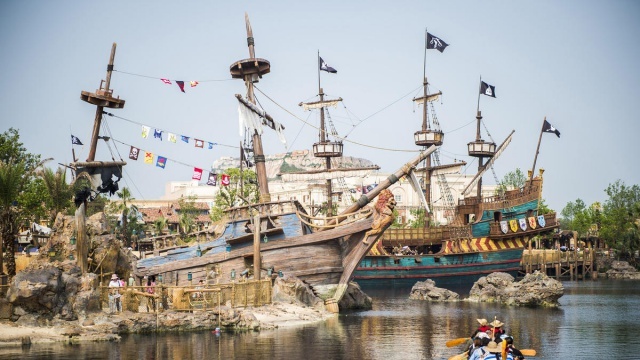 At the park on Thursday, Su Xuanjun, a native of western Sichuan province, complained about the pricey tickets but gushed about an attraction based on the “Pirates of the Carribean” movie. “It’s very impressive how they use technology in this ride,” said Su, who was accompanied by his wife, daughter and 4-year-old grandson. Still, he thinks Disney could have gone a bit further to make the park more “China-like”. Bloomberg News - 16 juin 2016. There was never anything Mickey Mouse about the price tag: $5.5 billion. And, sure enough, Shanghai Disney Resort is not a small world, after all. It's also at long last ready to strut its stuff. June 16 marks the official grand opening of what Walt Disney Co. CEO and Chairman Bob Iger calls "the most technologically advanced Disney park yet." Prepping for its premiere, this high-profile entry into the global theme-park industry underwent a full month of previews by invitation only — one of which this observer was lucky enough to grab. The break-in period allowed some 10,000 brand-new cast members (read: staff) the chance to work out the kinks and fine-tune everything from the boarding process to their phonetic English pronunciation of "Have a magical day." Typical of a Disney property, the first looks drew near-capacity crowds, equal doses of superlatives and speculation, and, much to the chagrin of the Mouse House, dozens of amateur videos posted to YouTube. But what word of mouth and GoPro captures can't convey is the sheer spectacle of the in-person experience. At 963 acres — more than six times the footprint of California's original 1955 Disneyland — Shanghai is about triple the size of its closest cousin, 11-year-old Hong Kong Disneyland Resort. Its Magic Kingdom-style theme park, Shanghai Disneyland, is made up of half a dozen themed lands clustered around the Enchanted Storybook Castle, the biggest palace in the Disney portfolio. Compared with the other parks in the Disney universe of Orlando, Fla. (which opened in 1971), Tokyo (1983) and Paris (1992), Shanghai is also the most expansive and richly detailed when it comes to showcasing its attractions. The nearly 200-foot-tall Enchanted Storybook Castle is home to all of the Disney princesses. Within resides numerous attractions, including Voyage to the Crystal Grotto, a gentle boat ride that ladles out classic character scenes amid dancing waters; the Once Upon a Time Adventure, featuring interactive participation with Snow White; and the Bibbidi Bobbidi Boutique, the service station where young girls are transformed into young princesses. "We are taking everything we've learned from our six decades of exceeding expectations ... to create a truly magical place that is both authentically Disney and distinctly Chinese," Iger said last year, when closely held plans were finally unveiled for the resort, which is 43 percent owned by Disney. The remainder belongs to China's state-owned Shanghai Shendi Group. Iger has called this new addition to the Burbank, Calif.-based company its most promising opportunity since the Chicago-born Walt Disney himself bought land in central Florida in the 1960s. As such, some traditionalists may come away surprised: Absent from Shanghai are a train around the circumference, Haunted Mansion hobgoblins and Small World cherubs. Similarly MIA are waterlogged Jungle Cruise elephants (unless you count the fountain of the Dumbo attraction, which itself has been repositioned to the forecourt of the castle), along with Space, Splash and Big Thunder mountains. Nor should one expect a Main Street gateway to the park; Walt Disney's personal slice of 1890s Americana has been swapped out for Mickey Avenue, a charming take on a 1920s-style Toontown. Not that every element of parks past has been given the old heave-ho. Peter Pan's Flight and Buzz Lightyear Planet Rescue have upped their game with noticeable technological enhancements, while a streamlined Tomorrowland glistens with the added advantage of actually looking futuristic, devoid of the techno-punk flourishes found in its American counterparts. Besides providing a home port for the heroes of Marvel Comics and Star Wars, the two-tiered Tomorrowland is defined by its neon-lit anchor attraction, TRON Lightcycle Power Run. The roller coaster whizzes by under a winged canopy, allowing ground-level visitors to judge for themselves whether their hearts could take the high-speed cycle journey. Shanghai's Adventureland is called Adventure Isle. Its towering peak, which shelters the Roaring Rapids water attraction, was still under scaffolding during my preview, although by night it was lit up in a majestic magenta. Meanwhile, under, around and through a lengthy Indiana Jones-style cave spiraled the line for Soarin' Over the Horizon (to be called Soarin' Around the World when it all-but-simultaneously opens in Anaheim and Orlando), the 2.0 version of the wildly popular hang-glider travelogue. Landmarks around the globe provide the attraction's new theme — citing them would only ruin the thrill — with the added surprise of dramatic aerodynamic dips that caused many in the preview audience to scream. Even so, little could compare with the loud gasps that met the masterful Pirates. Whether or not an optical illusion, the action-packed sea battle appeared to be in 3-D (without the need for special glasses) and the vessels life-sized. The villain Davy Jones, on the other hand, is supersized, and pretty darned scary. Hands down, however, the most affectionate response greeted Mickey, Minnie, Donald and Daisy, who hold court inside the castle's Royal Banquet Hall, at a $30-per-adult prix fixe dinner. (Reserve early.) Elsewhere, menus span east and west, from dim sum breakfasts to corn dogs and caramel corn snacks, to Asian BBQ ribs and vegetarian dishes. In terms of park admission, Shanghai's is less than those stateside: around $76 during the half-month grand-opening period (the first day has been sold out for months), after which standard adult entry will go to $57. In addition to a Disneytown shopping district and a 98-acre recreational area dubbed Wishing Star Park, there are two hotels on the property: the swank Shanghai Disneyland Hotel, where rooms start at around $250 a night, and the ultra kid-friendly Toy Story Hotel, starting at $130 a night. The resort is about a 20-minute taxi ride from Shanghai's Pudong International Airport. The fare is about $20 — the same as the 50-minute subway ride. As for the ultimate question, is Shanghai Disneyland worth the 15-hour flight from Chicago? Stephen M. Silverman pour Chicago Tribune - 16 juin 2016. Photo : Ng Han Guan / The Associated Press. Walt Disney Co. opened Shanghai Disneyland, its first theme park in mainland China, with a lavish celebration Thursday featuring Communist Party leaders, a children’s choir, Sleeping Beauty and other Disney characters. A vice premier joined Disney CEO Bob Iger in cutting the grand opening’s red ribbon, showing the ruling party’s support for the $5.5 billion investment in promoting tourism at a time of slowing economic growth. They read letters of congratulations from the Chinese and American presidents, Xi Jinping and Barack Obama. “This is one of the proudest and most exciting moments in the history of the Walt Disney Co.,” Iger said after the choir sang. Later, actors dressed as Sleeping Beauty, Donald Duck and other Disney characters danced on stage. The company hopes Shanghai Disneyland will burnish the brand behind “Frozen” in the world’s most populous film market and help revive Disney’s struggling international theme park business. Speaking as a light rain fell, Vice Premier Wang Yang quipped, “I would like to call this a rain of U.S. dollars or of renminbi,” the Chinese currency. The festive sentiment was tempered by news from Florida that an alligator killed a 2-year-old boy at Disney’s flagship Walt Disney World. The boy drowned after the animal dragged him into a lagoon on Tuesday. Despite slower growth, China’s economy still is one of the world’s best-performing and tourism spending is rising. “I think it’s really lively here and every girl can realize her dream of becoming a princess,” said Gong Haiyan, a visitor from western China’s Sichuan province. Disney’s opening follows a decade of negotiations, five years of construction and weeks of testing. Iger said more than 1 million visitors already have tried out its rides, shops, restaurants and two hotels. Near its iconic Storybook Castle, Disney created a “Garden of the Twelve Friends” using characters such as Remy from “Ratatouille” and Tigger from “Winnie the Pooh” as animals of the Chinese Zodiac. Disney says the Wandering Moon Teahouse, modeled on a building in eastern China, is the only Chinese-style structure in any of its parks. The park should generate some $1.5 billion to $4.5 billion a year in revenue, according to Drexel Hamilton analyst Tony Wible. However, Disney’s state-owned Chinese partner, the Shanghai Shendi (Group) Co. Ltd., which owns 57 percent of the 7.5-square-kilometer (2.9-square-mile) park, will get the lion’s share. Disney’s international parks in Paris, Hong Kong and Tokyo haven’t made a profit in six of the past 10 years, Wible figures. So the main advantage of the huge park may be promotion of the brand and merchandise. China is a challenging environment in other ways, with official controls on business activities and on taking profits out of the country. Live shows such as Disney’s “Lion King” musical must be approved by Chinese censors. Disney’s DisneyLife direct-to-consumer online movie and book offering was closed in April, five months after opening, amid a Chinese regulatory review. Jin Yasi, a 33-year-old housewife from Wuhan, came with her husband and their two daughters, aged 6 and 3, dressed as Elsa from “Frozen” and as Snow White. Jin said she has visited Hong Kong Disneyland, the company’s first park in Greater China, three times. Paul Traynor et Joe McDonald pour The Associated Press / The Seattle Times - 16 juin 2016. DISNEY Cast Members lined up along the Mickey Avenue near the entrance of the Shanghai Disneyland to welcome the first batch of guests after the theme park officially opened around 11:30am today. 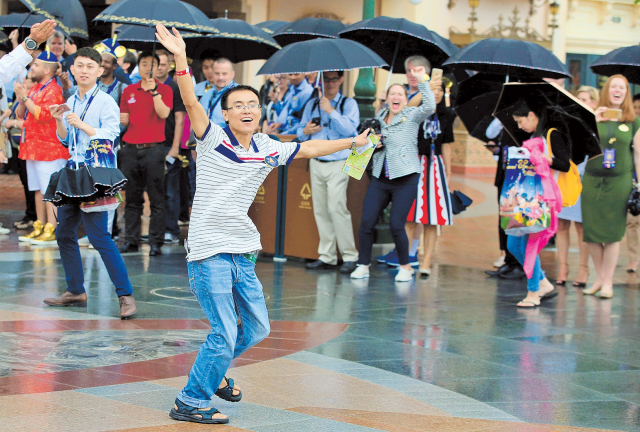 The Cast Members, that is how Disney employees are called, waved and clapped hands as visitors braved the drizzle to get a look at the first Disneyland on China’s mainland. Many of them rushed to the popular attractions in the park such as “Soaring over the Horizon” at the Adventure Isle. Others posed in front of the iconic castle. A security staff at the park entrance said visitors started arriving at the gate as early as 4:30am when some of the staff members began to make preparation for the official grand opening. The park will be open till 10pm today. Guests must have a ticket to enter as no tickets are being sold at the site today. Shawn Ryan Holt from the United States wore a hat with Mickey’s ear on it and held a Mickey Mouse doll while entering the theme park. “I used to study at a college in Orlando and became a big Disney fan. So I flew to Shanghai and waited in front of the gate at 9am today on the opening day of the Shanghai Disneyland,” he told Shanghai Daily. Hundreds of tourists from home and abroad queued up for hours outside the gates of Shanghai Disneyland before it formally opened to the public at lunchtime on Thursday. Despite the rain, many said they had come early because they wanted to be among the first in the theme park after its official opening. One family from China said they arrived at about 6am. Tourists queuing up also came from countries including Canada, the United States and Japan. Li Wengui from Zhaotong in Yunnan province was with her husband and five-year-old daughter, who is a big Disney fan. “She’s very excited and wanted to take a photo with Mickey Mouse, Snow White and Dumbo,” she said. Li said they were prepared for the high prices of food inside the park. Some Chinese tourists visiting the resort during its trial opening period had complained about the issue. The official opening has also attracted celebrities, including actress Tong Liya and gymnast Li Xiaopeng, who came with his daughter. The Shanghai resort, which includes the theme park and two themed hotels, has been operating on a trial basis for several weeks, receiving about a million visitors. Sources at local tourist agencies said about 10,000 tickets for Thursday were sold to the public due to concerns about crowd control. The opening of the resort has brought China’s tourism industry into a golden era, Vice Premier Wang Yang said at a ceremony at the theme park on Thursday. “Disney’s choice to build a theme park in Shanghai suggested foreign businesses were optimistic about the investment environment and future growth in the China market,” said Wang. He said US President Obama and President Xi Jinping had last year suggested making 2016 Sino-US Tourist Year to boost cultural ties and the opening of Shanghai Disneyland was a good example of this initiative. Wang also said China would further open up more sectors such as education, finance, health care and culture, creating more opportunities for foreign businesses. President Xi Jinping sent his congratulations and regards to everybody involved in the project for the “successful cooperation” between Shanghai and the US media giant Walt Disney Company. Shanghai Disney Resort, the first Disney resort in Mainland China and the sixth worldwide, celebrated its historic Grand Opening today, culminating one of Disney’s most ambitious projects ever. The wonder and imagination of Disney greeted the people of China in magical new ways as the gates opened to Shanghai Disneyland, a theme park like no other with the biggest, tallest castle in any Disney park, the first pirate-themed land and Disney’s most technologically advanced park to date. Bob Iger, chairman and chief executive officer, The Walt Disney Company, celebrated the opening of the one-of-a-kind vacation destination with thousands of distinguished guests, celebrities and Chinese officials. Shanghai Disney Resort reflects Disney’s 60-year history of innovation, creativity and storytelling, in a way that is authentically Disney and distinctly Chinese. Tens of thousands of guests entered Shanghai Disneyland on its Grand Opening day to explore world-class attractions and live entertainment spectaculars­—many being offered for the first time in a Disney theme park. Thousands more guests visited the resort’s Wishing Star Park recreational area and Disneytown, a vibrant retail, dining and shopping district that is home to the Walt Disney Grand Theatre, where guests may experience the first Mandarin production of Disney’s musical hit THE LION KING. Those areas, along with two imaginatively themed Disney hotels, offer guests a complete vacation destination with something for everyone—young and old, girls and boys, families and multi-generational guests. The three-day Grand Opening event also included two red-carpet occasions: Tuesday’s premiere of the first Mandarin production of THE LION KING, now showing at the Walt Disney Grand Theatre, and Wednesday’s gala concert with celebrity performers at Shanghai Disneyland. The six themed lands of Shanghai Disneyland invite guests to step into new worlds of imagination and fantasy. Adventure Isle immerses guests in a newly discovered lost world. The Gardens of Imagination celebrates the wonders of nature and joy of imagination with whimsical décor and interactive spaces. Mickey Avenue is the first main entry at a Disney theme park that’s inspired by the colorful personalities of Mickey Mouse and his pals. Tomorrowland is a place of limitless possibilities, where the promise of tomorrow looks brighter than ever. Treasure Cove is the first pirate-themed land in a Disney park, a place to join the adventures of Captain Jack Sparrow and Davy Jones. The largest of all the lands, Fantasyland, is inspired by Disney’s animated films and home to the majestic Enchanted Storybook Castle – the tallest, largest and most interactive Disney castle in the world. Adjacent to the theme park is Disneytown, which features approximately 50 international shopping and dining locations in five unique areas. The World of Disney Store, the first in Asia, offers a comprehensive collection of Disney merchandise, with products designed especially for Shanghai Disney Resort and the Grand Opening. The lavish Walt Disney Grand Theatre, also in Disneytown, is now playing the Mandarin premiere of Disney’s hit musical, THE LION KING, a separately-ticketed event. Guests may continue their Disney experience at the resort’s two hotels, the elegant Shanghai Disneyland Hotel and the whimsical Toy Story Hotel. The themed hotels are conveniently located near Shanghai Disneyland and promise a fun, relaxing stay. Incorporating unique characteristics that Chinese guests will recognize and appreciate, Shanghai Disney Resort offers a distinctive Disney experience that reflects the beauty and unique identity of today’s China—from traditional regional dining cuisine and Chinese acrobatic performances, to the Shikumen architecture at Disneytown and Chinese Zodiac designs in Garden of the Twelve Friends. Under stormy skies, Disney opened a bright and shiny $5.5 billion theme park here Thursday, a bet on the increased spending power of the Communist country’s growing middle class. Disney’s President and CEO Bob Iger and senior Chinese politicians cut the red ribbon just after 11 a.m. local time in a short ceremony in front of the enchanted castle. Fireworks shot into the air and the gates were opened to the crowds outside – some of whom had been waiting since 3:45 a.m. While Disney doesn’t have the same brand recognition it does in the West, Chinese people are coming to know many of the characters as the Communist government allows more films inside the country. “All of their films are beautiful,” said Wang Yilin, another early arrival. Despite predictions of chaos and overcrowding, the opening went smoothly. The thousands of early arrivals entered the park within two hours. Disney said “tens of thousands" had visited Thursday. The rain, which drizzled for most of the day, broke into a tropical downpour around 4 p.m.
Chinese politician Wang Yang joked that “Iger had a good relationship with God” because rain is symbol of wealth in China. “I would like to call this the rain of American dollars and Chinese Renminbi,” he said, using the formal name for China’s currency. Besides the weather, the China opening was dampened by the death of toddler who was dragged under water by an alligator at a Disney World resort in Florida. “My thoughts and prayers are with them, and I know everyone at Disney joins me in offering our deepest sympathies,” Iger said in a statement. In a sign of how significant the park's opening was, presidents of both countries sent letters of congratulations. “Blending a U.S. business with the beauty and rich cultural heritage of China, this resort captures the promise of our bilateral relationship,” wrote President Obama. President Xi Jinping said in his letter he was a “strong supporter” of the park. “I hope Shanghai Disneyland can stay true to the idea of sharing happiness and friendship and provide visitors with safe, premium and enjoyable experiences,” he said. China’s tourism market is worth $610 billion, according to government figures. It is expected to keep growing as the ruling Communist party tries to move the economy away from heavy industry and manufacturing. There are already some 300 theme parks in China and another 60 on the way, but nothing comparative with the size and scope of Disney. Shanghai Disney Resort covers 963 acres, more than 11 times the size of the originalDisneyland in Anaheim, Calif. Its enchanted castle is Disney’s largest and tallest. And in the coming year, its catering staff will wash and prepare more than 12 million heads of Bok Choy — Chinese cabbage. “I have never seen anything like it,” Su Xuanjun, 60, a teacher who had just experienced Pirates of the Caribbean: Battle for the Sunken Treasure, one of the big ticket rides. The resort is Disney's sixth, and fourth overseas. The other foreign locations are in Paris, Tokyo and Hong Kong. “The technology was so advanced. Initially I thought the tickets were too expensive, now I think its worth every penny,” Xuanjun said. The wait for most rides was under an hour. At one point the line for Soaring Over the Horizon – a ride where you appear to fly over the wonders of the world, including the Great Wall of China — was over 150 minutes. 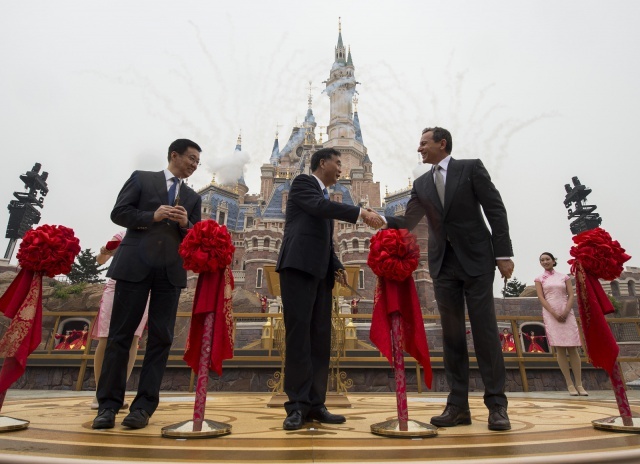 The mantra of the park is “authentically Disney, distinctly Chinese,” Iger has said. Yet, Su Yan, a 44-year-old stockbroker who has lived overseas, said the park felt very American to her. Hannah Gardner pour USA Today - 16 juin 2016. THE queues began to form at 4:30am. Some visitors carried suitcases, having come straight from the airport. At least one fan flew in from the United States just to be there. And one romantic man made it an extra special day by proposing in front of the iconic castle. 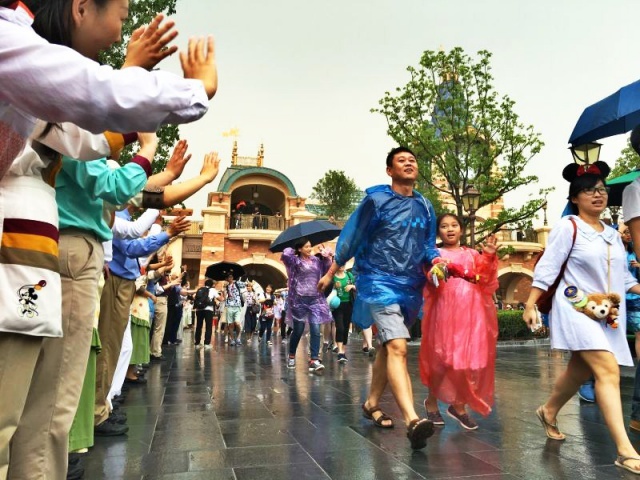 It was Shanghai Disneyland’s official opening day and cast members, as Disney calls its staff, were out in force to greet the thousands queuing to get in despite the drizzle. Because of the rain, the theme park opened its gates around 11:30am, half an hour earlier than scheduled. Long queues had formed from around 9am. A woman from Shanghai’s suburban Jinshan District said she had waited for at least an hour at the entrance to go through the security check, but found she had to join another queue to get the ticket she’d booked online and then waited at another entrance with her ticket in hand. People had to wait for at least an hour on average to enter the park after it opened, though all 32 entrances were in use. When they did get in, many rushed to attractions that had proved most popular during trial operations, such as “Soaring Over The Horizon” at Adventure Isle. Shawn Ryan Holt, who had flown in from the United States, was wearing a hat with Mickey Mouse ears and was holding a Mickey Mouse doll as he entered the park. “I used to study at a college in Orlando and became a big Disney fan. So I flew to Shanghai and waited in front of the gate at 9am today,” he said. A member of the security staff said visitors had begun arriving as early as 4:30am. Not far behind them were a group of tourists from Japan who had their luggage with them. They had touched down at Pudong International Airport at 5am and decided to head straight for the park. Inside, waiting time for most attractions was under an hour, in marked contrast to lengthy delays during the monthlong trial operation. The “Soaring Over The Horizon” attraction, an aerial tour of the world, had a waiting time of just 20 minutes. Other crowd favorites included “Roaring Rapids,” where guests ride on a raft propelled by gravity and water through Adventure Isle, and a pirate-themed show called “Eye Of The Storm” at Treasure Cove. The park has a designed capacity of 40,000 visitors. The park stayed opened until 10pm and the day wrapped up with a light show around the Enchanted Storybook Castle, the world’s largest and tallest Disney castle. Analysts expect Shanghai Disneyland to become the world’s most-visited theme park, attracting at least 15 million and as many as 50 million guests a year. By contrast, Walt Disney World in Florida drew 19.3 million people in 2014, according to The Associated Press. YouGov, a market research firm, said 44 percent of people it surveyed in China in May plan to visit Shanghai Disneyland within a year. AN exhibition at Shanghai Library shows that Disney was popular in the city as far back as the 1930s and 1940s. As Disney films were delighting audiences around the world, Shanghai residents were getting to know Mickey Mouse and Snow White via numerous local newspapers, magazines and books. The Young Companion magazine was the first to publish a feature story about Walt Disney and Mickey Mouse in January 1932. It even carried a cartoon depicting Mickey and Goofy reading the magazine. Another exhibit is a newspaper article written by the then 17-year-old Zhang Ailing, who went on to become, as Eileen Chang, one of the famous modern Chinese writers. Shanghai Daily - 17 juin 2016. Shanghai Disneyland has churros and turkey legs, we're told, but we searched and searched and couldn't find them. Corn dogs are easily the most popular food item. Everybody seemed to be chomping on them. Caramel popcorn is a popular treat at Shanghai Disneyland. We saw many food carts with caramel popcorn but we didn't see any plain popcorn. We saw lots of sodas but not a lot of diet soda. In Disneytown you can find Starbucks, the Cheesecake Factory, Wolfgang Puck's Kitchen and a myriad of restaurants and bars that would be found in any major city in the United States. Shanghai Disney Resort s'expose au pavillon chinois d'Epcot à Walt Disney World Resort. un article très complet paru dans Le Monde du 18 juin "Mickey et Minnie à la conquête de l'empire du milieu"
Disney inaugure, jeudi 16 juin, son premier parc en Chine continentale, à Shanghaï. C’est le plus cher de son histoire. Le pays devrait être, dès 2017, le premier marché mondial du cinéma. La concurrence y est rude. En arrivant dans la station de métro Disneyland Shanghaï, les voyageurs sont accueillis par deux grandes statues de Mickey et de Minnie qui imitent le style chinois traditionnel du papier découpé. « Authentiquement Disney, mais distinctement chinois », répète le patron de Disney, Robert Iger, au sujet du premier Disneyland de Chine continentale – un parc a ouvert à Hongkong en 2005. Il sera là en personne, jeudi 16 juin, pour inaugurer le parc. Pour le fleuron de la culture hollywoodienne, pas question de décevoir la classe moyenne chinoise grandissante : dès 2017, le pays devrait représenter le premier marché du cinéma au monde. Les concurrents ­chinois n’y manquent pas, à l’image du groupe Wanda, présidé par l’homme le plus ­riche de Chine, Wang Jianlin, qui dénonce « une invasion culturelle ». Disney n’a pas lésiné sur les moyens pour son sixième parc : avec 5,5 milliards de dollars (4,87 milliards d’euros), c’est le plus cher de l’histoire. Un investissement assumé à 43 % par Disney et à 57 % par un fonds d’investissement de la ville de Shanghaï, en fonction des parts de chacun. Le château iconique de la Belle au bois dormant, avec ses murs rose pâle et son toit bleu, est le plus vaste au monde, et trône au milieu d’un parc de 370 hectares, qui comprend un lac, des hôtels et un « village » de restaurants et de boutiques. La division « parc et hôtels » de Disney a rapporté 16,2 milliards de dollars de recettes au groupe en 2015, soit 31 % de ses recettes totales. Les clins d’œil à la culture locale sont ­nombreux. Outre des restaurants chinois à côté des diners à burgers, une allée, dans le centre du parc, illustre les douze animaux du zodiaque chinois grâce à des personnages classiques de Disney. Sans pousser la touche chinoise au-delà des détails. Mulan, par exemple, l’héroïne de Disney, qui défend la Grande Muraille de Chine, n’a pas de traitement de faveur. Peut-être parce que le dessin animé, sorti en 1998, est trop ancien pour parler aux jeunes visiteurs. Les attractions shanghaïennes sont toutes liées à des films récents : Tron (2010), Alice au pays des merveilles (2010), dans la version de Tim Burton, ou la série « Pirates des Caraïbes » (prochain opus en 2017). 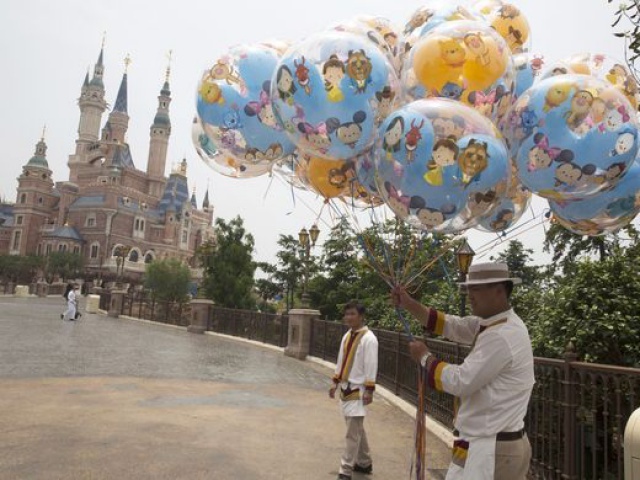 Le Disneyland shanghaïen accueille surtout le dernier cri en termes d’attractions. Le Tron Lightcycle Power Run, inspiré des motos futuristes du film de science-fiction, est le manège le plus rapide de tous les parcs de Disney. Les passagers, penchés sur des sortes de grosses motos de course, sont propulsés à 96 km/h. Frisson assuré. « C’était génial, je voudrais le ­refaire ! », s’exclament, en chœur, trois jeunes femmes, à la sortie. Mais pas sûr qu’elles soient prêtes à refaire les trois heures de queue qui étaient nécessaires, vendredi 10 juin, pour atteindre le manège, dans un parc qui en était encore aux essais. Pendant tout le mois de mai, il a accueilli des invités, en augmentant progressivement l’affluence jusqu’au jour J. « C’est super, mais il y a vraiment trop d’attente », remarque l’une d’elles, Qin Lin, 27 ans, qui a obtenu des tickets en avant-première par son entreprise, ­Alibaba, partenaire de Disney en Chine. Sur Internet, le prix des billets s’est aussi ­attiré les critiques. Entre 370 yuans et 499 yuans (entre 50 et 67 euros), selon les périodes, l’entrée n’est pas à la portée de toutes les bourses. En comptant trois tickets, deux repas et quelques souvenirs, une journée chez Mickey revient à 2 600 yuans pour un couple avec un enfant, selon les calculs du quotidien hongkongais South China Morning Post. Plus que le salaire mensuel moyen chinois en 2015, qui s’élevait à 1 830 yuans, selon le bureau ­national des statistiques. Disney n’a pas choisi Shanghaï au hasard. C’est dans cette métropole que l’on trouve les salaires les plus hauts de Chine : 5 891 yuans par mois, en 2015. Disney estime que, à trois heures de transport de cette ville, 330 millions de personnes ont des revenus suffisants pour être des clients potentiels. Alors que la croissance du produit intérieur brut chinois est au plus bas depuis vingt-cinq ans (6,9 % en 2015), la consommation continue de progresser de plus de 10 % par an. Celle des jeunes, en particulier : la consommation des moins de 35 ans augmente de 14 % par an. Disney n’est pas seul à avoir flairé la bonne affaire. Ces dernières années, 300 projets ont été lancés, selon le quotidien chinois National Business Daily. En 2015, vingt et un parcs ont ouvert et vingt sont en construction. Parmi eux, un Hello Kitty Park, un Water Park, ou un Discovery Park, ouvert par la chaîne de télévision américaine. Plus ambitieux, le fonds d’investissement hongkongais Carnival Group International prévoit l’ouverture d’une dizaine de parcs à thème dans les cinq ans à venir. Wanda vise une clientèle moins riche que celle de Disney : ses parcs vont pousser dans des villes de deuxième ou troisième niveau. Les tickets du premier Wanda Park, inauguré le 28 mai, à Nanchang, dans le Jiangxi (est), coûtent entre 200 et 248 yuans, selon les périodes, la moitié du prix des billets de Disneyland. D’après le site du parc Wanda, la construction de ce dernier a coûté 21 milliards de yuans. Wang Jianlin veut croire que Disney est dépassé. « L’époque où Mickey Mouse et Donald Duck provoquaient la frénésie des fans est terminée. Ils clonent de la propriété intellectuelle qui appartient au passé, sans aucune innovation », a déclaré le magnat, lors d’une émission de CCTV, le 22 mai. Jouant sur le nationalisme chinois, l’ancien officier de l’armée a juré d’empêcher Disney de faire du profit avec son parc, dans les dix à vingt prochaines années. La propriété intellectuelle est pourtant ce qui manque à Wanda face à Disney. « Tout le monde connaît les personnages de Disney », souligne un jeune père de famille, son fils dans les bras, dans le magasin officiel Disney, à la sortie du complexe. Même sans avoir ­obtenu de ticket, il a emmené son fils voir la boutique et les alentours du parc. « Même si Wang Jianlin est déjà bien installé en Chine, la culture Disney est une force », avance le père de famille, qui pense acheter des tickets une fois la folie de l’ouverture passée. En attendant, son fils repart avec un Mickey en peluche. Disney n’est pas un petit nouveau en Chine. Blanche-Neige et les sept nains, son premier long-métrage, a été diffusé dans un cinéma de l’avenue de Nankin, en plein centre de ­Shanghaï, en 1938, un an après sa sortie américaine. En 2015, la Chine a représenté le ­second marché pour Disney, après les Etats-Unis. Dans le parc chinois, nombre de petites filles sont déguisées en Elsa, la princesse de La Reine des neiges (2013), gros succès en Chine. Assez pour assurer le succès économique du parc ? Pas évident. Si les deux parcs américains de la marque fonctionnent très bien, le bilan des centres installés à l’étranger est mitigé. Celui de Tokyo, opéré par un partenaire qui paie des royalties à Disney, marche bien, mais ceux de Paris et de Hongkong peinent à dégager des bénéfices. Mais, avec son parc, Disney espère aussi faire progresser sa marque dans le pays, qui devrait dépasser les Etats-Unis en nombre d’entrées dans les cinémas, en 2017. « Comme Walt a fait grandir la marque de Disney aux Etats-Unis avec [le premier] Disneyland dans les années 1950, nous pensons qu’il y a une possibilité de faire la même chose en Chine », expliquait le patron de Disney, Robert Iger, à des investisseurs en 2009, juste après avoir obtenu une autorisation essentielle pour l’ouverture du parc de Shanghaï. Le développement des géants internationaux des médias n’est pas un long fleuve ­tranquille en Chine. En avril, DisneyLife, un service de contenu en ligne proposé par Alibaba à la suite d’un accord entre les deux entreprises, a été suspendu à la demande du régulateur des médias chinois. Le même mois, les services iBooks et iMovie d’Apple l’ont aussi été. Une loi, adoptée en février, ­interdit aux entreprises étrangères de publier quoi que ce soit en ligne. Disney a d’autres cartes dans son jeu : le 9 juin, Robert Iger a annoncé qu’une coopération avec Shanghai Media Group Pictures, une entreprise détenue par la municipalité, allait produire son premier film cette année. Une manière de s’assurer des projections dans le pays où les productions étrangères sont limitées à un quota de trente-six films par an. Et un nouveau champ pour la bataille engagée avec Wanda, qui y détient 292 cinémas. Le conglomérat a racheté les studios ­Legendary Entertainment pour 3,5 milliards de dollars, en janvier : le producteur de la série sur Batman, The Dark Knight, mais aussi du ­récent Warcraft, adaptation du jeu vidéo à succès. Le film, tout en effets spéciaux, a fait un flop aux Etats-Unis, mais a réalisé l’une des meilleures sorties de l’histoire… en Chine, le 8 juin. Disney inaugure jeudi 16 juin son premier parc de loisirs en Chine continentale. Le complexe de Shanghai abrite le plus grand château Disney au monde. Le groupe a investi presque 5 milliards d'euros. Mais Disney n'est pas l'unique mastodonte du divertissement désirant s'attirer les faveurs des Chinois. L'empire du Milieu en compte plus de 3 000, d'après les analystes de Nomura, dont 300 à thèmes. Par ailleurs, cette inauguration intervient dans un contexte morose. Le pays vient d'enregistrer sa plus faible croissance en un quart de siècle, après des décennies de progression à deux chiffres tirée par les investissements gouvernementaux. 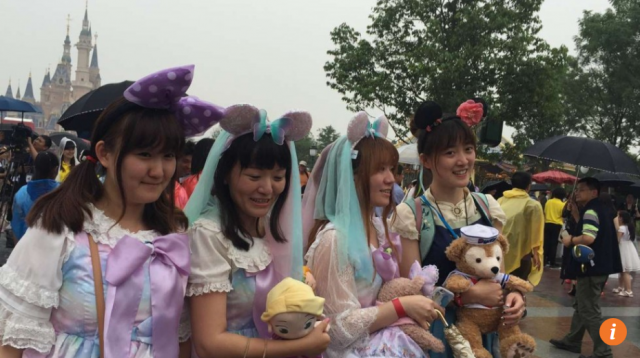 Alors, Disney peut-il s'imposer dans les parcs de loisirs en Chine ? - Avec: Léon Laulusa, professeur à l'ESCP Europe. Denis Gancel, président et cofondateur de W&Cie, auteur de "La société des marques". Ainsi que Rodolphe Bonnasse, président de CA Com. - Les Décodeurs de l'éco, du mercredi 15 juin 2016, présenté par Fabrice Lundy, sur BFM Business. Merci xzerus d'avoir recopié ici l'article du monde car leur site est inaccessible (image toute noire bloquant l'écran). Petit article (en Anglais) comme quoi "Shanghai Disney Resort paye ses employés un tiers des salaires de Hong-Kong Disneyland Resort"
Workers at Shanghai’s Disneyland, which opened last week, only get paid around a quarter to one third of what Hong Kong Disneyland workers receive, according to staff speaking to RTHK. Cleaning staff at the park are only paid up to RMB4,000 (HK$4,700) per month, which is about the same as similar jobs in Shanghai, staff said. A greeter said she earns about that amount per month. According to Glassdoor.com, US Disneyland workers earn about US$1,600 (HK$12,416), assuming a 40-hour workweek. The greeter said the difference in pay makes her “uncomfortable,” but added that the company also provides medical benefits. According to Shanghai Disneyland’s hiring site, the park provides medical insurance, holidays, bonuses, boarding or housing stipends for front-line performers, and other benefits including passes for friends and family. 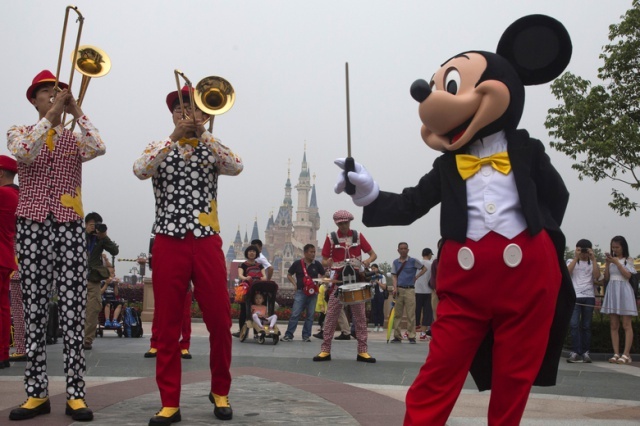 Hong Kong Disneyland’s trade union have criticised Disney for “not taking social responsibility as an international organisation and exploiting its low-pay Shanghai workers,” according to the broadcaster. The regular entrance fee at Shanghai Disneyland is set at RMB370 (HK$436). Prices at Disneyland already made headlines in China in May, when netizens complained about buns costing RMB35 (HK$41), saying the prices surpassed those at Tokyo Disneyland. Customers interviewed in a CCTV report over the weekend said they could accept the higher prices at a “high-quality” resort like Disneyland. En comparaison d'un salaire moyen chinois (environ 2000 yuans selon l'article du monde 18 juin) celui d'un cast member à Shanghai semble correcte. D'ailleurs, si je me souviens bien les articles de presse, il y avait foule lors des séances d'entretien d'embauche. Article publié ce jour dans Shanghai Daily. Une interdiction pour le vol de drône dans la zone du Shanghai Disneyland Resort. OPERATORS of unauthorized drones caught flying over the core part of the Shanghai International and Tourism Resorts Zone, which includes the Shanghai Disney Resort, could be fined up to 30,000 yuan (US$4,518), the zone’s management committee said yesterday. Individual pilots will be fined 500 to 2,000 yuan and companies will face a penalty of up to 30,000 yuan, according to a new regulation publicized by the committee yesterday. “The committee has found numerous unauthorized drones flying over the core area of the zone recently to take photos, which raises safety concerns,” a committee official said. The regulation is similar to one enforced during the World Expo 2010, she added. All drones, helicopters, gliders, airships and hot-air balloons taking off, landing or flying over the the core area of the zone must receive approval from the authority in advance, according to the regulation. Drone photography has become a popular activity over the zone and many aerial shots of Disneyland and the zone’s other attractions have appeared on the Internet. This activity has sparked public safety concerns because of the risk of the remote-controlled miniature aircraft crashing and injuring visitors on the ground. In a popular video posted by a local drone pilot in April, a drone falls to the ground after its battery runs out inside the Disney resort. In addition to banning drones, the regulation also prohibits ticket selling, begging, swimming, climbing onto structures and setting up stalls within the 7-square-kilometer zone in Pudong’s Chuansha. Authorities in the Pudong New Area have established an enforcement team comprising more than 100 officers. 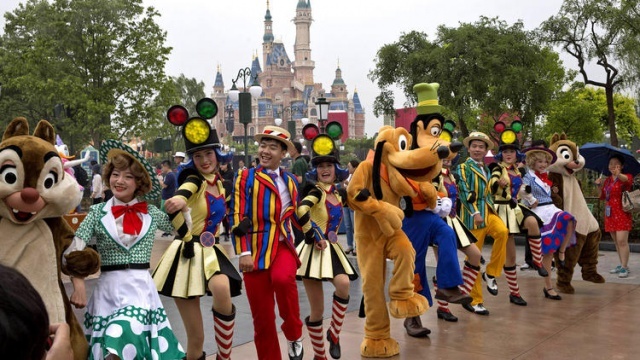 Shanghai Disney Resort is set to become a key venue for local students to celebrate key milestones in their youth and academic pursuits, as hundreds of students and faculty descend on the resort’s theme park to celebrate the end of school year and start of summer holidays. Disney resorts around the world are traditionally key destinations for students to celebrate the end of exams, celebrate graduation moments and pursue their imagination and creativity in an exciting, safe and friendly environment. 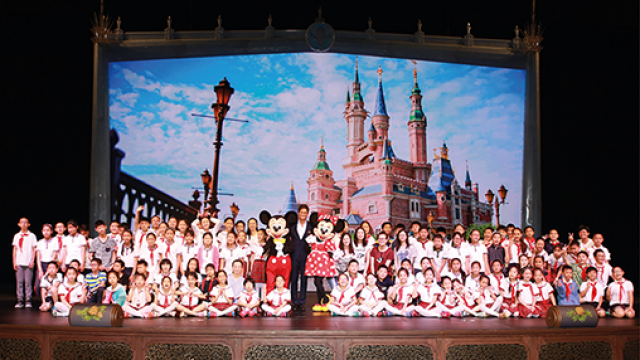 To celebrate the start of this tradition in Shanghai, today over 500 students and teachers from elementary, middle and high school celebrated at Shanghai Disneyland, capturing photo moments and celebrating the success of their studies and friendships. The energy and optimism of youth is a special emotion and Shanghai Disneyland is a perfect venue for our youth to cherish their friendships, celebrate the success of their studies, foster their imagination and creativity, and follow their dreams. The General Manager of Shanghai Disney Resort, Philippe Gas, and Mickey Mouse and Minnie Mouse, will join students and faculty members in the park today. "For decades, Disney Parks and Resorts have been committed to supporting the healthy growth and development of our youth, providing students of all ages with a chance to embark on unforgettable journeys through the world of Disney. We hope that Shanghai Disneyland will become a beacon of creativity and imagination for young minds from across the globe.” said Gas. Shanghai Disney Resort inspires young minds to step out of their everyday lives and into a world of wonder at Disney, where students discover magic, creativity and innovation through Disney's immersive storytelling experience. During Wednesday's visit, students and faculty members will enjoy the comprehensive offerings at Shanghai Disneyland, including popular attractions like Roaring Rapids, Pirates of the Caribbean: Battle for the Sunken Treasure, Seven Dwarfs Mine Train and TRON Lightcycle Power Run. They will also experience the world-class entertainment offerings like "Tarzan: Call of the Jungle," "Frozen: A Sing-Along Celebration" and "Eye of the Storm: Captain Jack’s Stunt Spectacular." Students will also have the exciting opportunity to meet superheroes from Marvel Cinematic Universe, and have their photographs taken with Mickey Mouse, Captain Jack Sparrow, Disney princesses and other beloved Disney Characters. Shanghai Disney Resort - 29 juin 2016.